The Lenovo ThinkPad T480 is a business laptop that is robust yet light enough to accompany users everywhere. Lenovo’s ThinkPad laptop offers a lot of customization when it comes to hardware components. This means that a user can customize the business notebook to fit their personal needs. The secondary battery, which can be added to the main internal battery, is a special feature here. As a genuine business notebook, the T480 has several security features to offer: Besides the almost-obligatory TPM-2.0 module and Kensington lock, the T480 also has many other features, such as NFC, an optional SmartCard reader, and the always-included fingerprint reader. The fingerprint scanner works flawlessly with Windows Hello. The manufacturer relies on a black case with a seemingly rubberized surface. This is why the device is very easy to hold, though it does make the laptop very susceptible to smudges. The chassis is made of tough plastic and is therefore very rigid. The hinges have no problem holding the display lid in a set position and have an opening angle of 180 degrees. When it comes to the dimensions, the ThinkPad T480 is almost identical to its predecessor, the T470. However, the additional battery has quite an impact on the overall weight of the device - the relatively high overall weight of 1.8 kg (3.96 lb) can be attributed to the 48-Wh ancillary battery. The T480 comes with an Intel Core i5-8350U CPU, an Nvidia MX150 GPU, 8 GB of RAM and a 256GB PCIe SSD. This is why the business notebook can be used not only for simple office work but also for image and video editing and, to a very limited extent, for gaming. Besides that, the 720p lens on the ThinkPad T480 captures images with solid colors and brightness for a built-in webcam. In terms of the ports, only slight changes were made when compared to the Lenovo T470: On the left-hand side, a previously-available USB Type-A port has been replaced by a Docking port, which used to be located on the underside. Many extras from Lenovo can be connected through this port. This is why the number of normal USB-3.0 Type-A ports has been reduced to only two. That being said, the Docking port is connected via Thunderbolt 3. The power jack has also been removed. The ThinkPad T480 is now charged via a USB Type-C port. The ThinkPad T480 is the battery-life king: With its six-cell, 72-watt-hour battery attached, the T480 lasted 17 hours, which involves continuous web surfing over Wi-Fi. 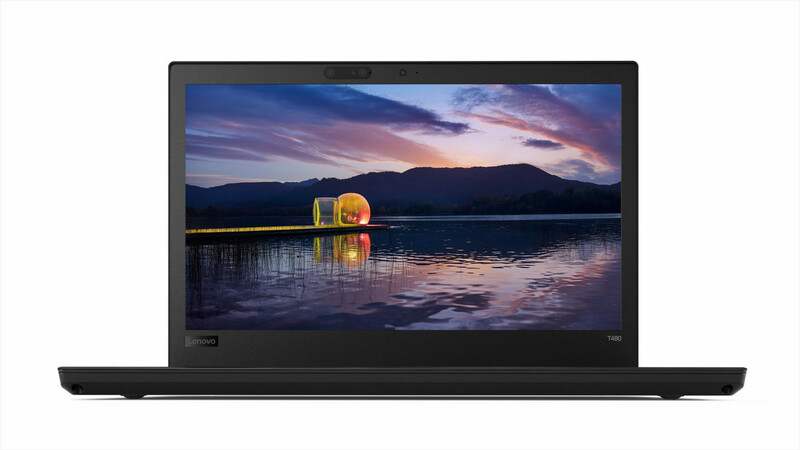 Because the ThinkPad T480 uses Lenovo's hot-swappable Power Bridge battery system, users can even carry extra batteries with them and swap them in without shutting the laptop down.